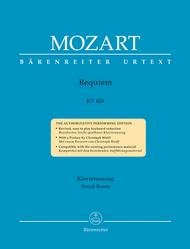 Requiem, K. 626 (Mozart's fragment completed by Joseph Eybler and Franz Xaver Sussmayr). Composed by Wolfgang Amadeus Mozart (1756-1791). Edited by Leopold Nowak. For Soprano voice solo, Alto voice solo, Tenor voice solo, Bass voice solo, Mixed choir, Orchestra. This edition: Paperback, Urtext edition. Paperback. Barenreiter Study scores. Classical Period. Difficulty: medium-difficult. Study score. Introductory text. K. 626. 163 pages. Duration 55 minutes. Published by Baerenreiter Verlag (BA.TP152).ISBN 9790006201303. With introductory text. Classical Period. 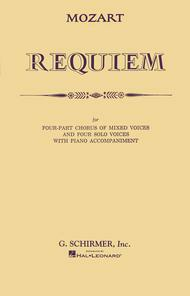 6.5x9 inches.The Requiem, completed by Franz Xaver Sussmayr, in its traditional form. 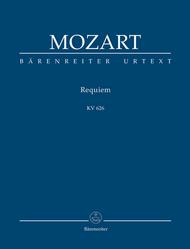 Requiem, K. 626 (Mozart's fragment in the version completed by Joseph Eybler und Franz Xaver Sussmayr). Composed by Wolfgang Amadeus Mozart (1756-1791). Edited by Leopold Nowak and Heinz Moehn. For soprano solo voice, alto solo voice, tenor solo voice, bass solo voice, SATB choir and piano accompaniment. This edition: Paperback, Urtext edition. Paperback. Classical Period and Sacred. Difficulty: medium-difficult. Vocal score. Choral notation and piano reduction. K. 626. 80 pages. Duration 55 minutes. Published by Baerenreiter Verlag (BA.BA4538-90).ISBN 9790006450152. With choral notation and piano reduction. Classical Period and Sacred. 7.5x10.5 inches.Mozart's fragment with additions by Joseph Eybler and Franz Xaver Sussmayr. Requiem, K. 626 (SATB). Composed by Wolfgang Amadeus Mozart (1756-1791). For Choral, Piano (SATB). Choral Large Works. Classical Period. Difficulty: medium to medium-difficult. Vocal score. Choral notation and piano reduction. K. 626. 80 pages. G. Schirmer #ED1882. Published by G. Schirmer (HL.50324450).ISBN 0793555132. With choral notation and piano reduction. Classical Period. 6.7x10.5 inches.Latin.